I feel much like the protagonist in Microsoft's Age of Empires game; at the beginning the only rays of light shine on me and my target at the other corner of the map. I need to get to the target but there's a problem. Everything is dark out there. I don't know the way. The darkness camouflages danger but also opportunities. I don't lose if I don't move, but I don't win either. As I start moving around feeling my way, the blanket of darkness lifts gradually, revealing reality. Sometimes I hit a dead end, forced to backtrack and embark on a new path, but at other times I get lucky and hit jackpot soon. There is a huge premium attached to action and adaptability to a dynamically evolving environment. Investing is similar in many respects. The ghost of uncertainty lurks in the darkness at every turn in Investorville. But decisions have to be made. Often based on an incomplete, uncertain and biased perception of reality. As in the game, ones experiences are coloured by the paths one chooses over time. Is the gilded past a harbinger of a bleak future? In this post, I conjecture the prospects for US equities as an asset class, viewed through the lens of economic history. Growth or Stability? Do investors pay for growth or stability? A combination of both determines the price investors are willing to pay for in the long run. Growth initially tends to fetch a premium and the basket of growth companies/economies that fail to take the step up fall by the wayside. The ones that do make the cut eventually see the pace of growth slowing but perceptions of stability emanating from size, market positions, moat etc. support premium valuations. 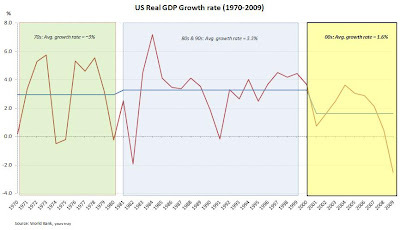 Turning to US real GDP growth rates over the past 40 years and thinking along similar lines for the economy, the present position seems weak on both fronts. GDP growth averaged ~3% over the 1970s up to 2000. The 30 years witnessed its share of recessions, battles with periods of high inflation and slow/negative growth. Growth has since slowed to average 1.6% in the past decade...and then the economy hit the dreaded iceberg. While the worst may be behind us, the near term is unlikely to see a jump in recovery. If anything, the debt-fuelled growth of the past plus the debt to keep the economy afloat will call for years of austerity. Growth is likely to be muted over the next decade. How much will it be? I can't pluck a number out of the brain, but I suspect one would be content to see a repeat of the trendline growth of the past decade. thechartstore.com has an interesting chart plotting the Market Cap/GDP ratio for US equities over the past 85 years. The ratio saw a big jump in the 90s breaking away from trend, reacting to years of strong, sustained economic growth. The bubble popped in 2000 and the ratio has been on a downtrend since, but has remained above 100% for most part. The recession pushed the ratio down to 70% but has returned back to 100% levels. When I think of the underlying factors that could support this ratio, I find myself soon running into a void. Sure the US economy is 3x its 1970 level. But the weights of debt, inflation and slowing growth have been gradually piling up on the other side of the value weigh-scale, almost unnoticed. A future of likely anemic growth and years of deleveraging makes me circumspect on the long-term prospect for equities. I don't know if the ratio will fall to its long-run average of 60%. I would assign a low probability to that, given the structural changes to the global economy over the past century. But when I search for catalysts that could propel the ratio, I can't seem to see very many to get me scampering to hit the Buy button. On balance, I feel equities are in for a period of flat-to-down movement. The past 110 years have seen alternating bull and bear cycles of roughly 20 years each. There is no law that demands adherence to the 20-year itch but the psychological aspect of history and the balance of odds seem to favour horizontal-down movement. 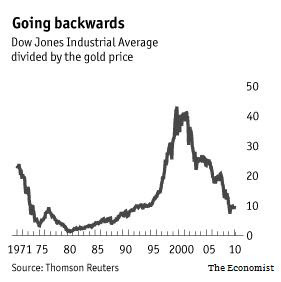 As gold levitated in the 1970s the ratio floated down eventually bottoming in 1980. Then as gold settled into a multi-decadel horizontal/down range and equities performed strongly in the 1990s, the ratio shot up towards the end of the 90s. The end of the equities party marked the beginning for gold's and the ratio collapsed again. Two factors further strenghten my hypothesis for soft equity performance. The alternating relative price movements for equities and gold leads me to think that its gold's time under the sun in the years ahead, relative to equities. There is a good chance of the mountainous stimulus packages leading to a high inflation future. Japan's experience with re-inflating its economy over the past two decades failed and there could be a repeat in US' case. Given the structural differences in the economies, I would bet on a high inflation future...which is favourable for gold. The scary scry may not be scary after all! The above graph is definitely very interesting. 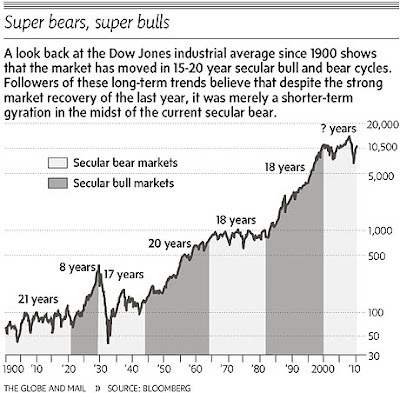 So do you think we are in a secular bear market? To me it seems like we could either be in a period such as 1929-1939 where we see significant decline followed by a sharp recovery and then more declines, or a period such as that of 1964-1982, where we see just a completely stagnant market. I'd posit a flattish trend overall, declines interspersed with recoveries. The divergence in market valuation and underlying GDP performance, considering the outlook over the next 5 years leads me to think that a flattish trend for equities could be the most likely outcome. It is tough to see catalysts that will support an upward trend in equities in a scenario of sluggish GDP growth. As you note as well, the secular trend for gold seems more enticing. Although, I would think the near term could see some weakness.